Where's the roasted hatch chile guy? He was at our local farmers' market in August. Now he's gone, and I'm angry. That's because last time we saw him, Jeff turned to me and asked, "Do you want a 5-pound bag or a 20-pound bag?" "20 pounds?! What am I gonna do with 20 pounds of roasted hatch chiles?" I said, incredulous. We bought the 5-pound bag. Now I'm hatch chile-less. I had no idea I'd become so attached. I can't stop thinking about them. I can still see that circular roaster tumbling warm hatch chiles like clothes in a dryer. I can still smell their woodsy, spicy fragrance that reminds me of crisp autumn nights in front of a fire. I can still taste their smoky, mouth-filling flavor and salivate at the memory every time. I'm in hatch chile withdrawal. If you've had hatch chiles, then you understand. If you haven't had hatch chiles, then find some. Quickly. Then add them to salsas and relishes, put them on hamburgers or hotdogs with Jack cheese, and fold them into scrambled eggs. When you run out, call me. We'll commiserate. I haven't told Jeff this, but if the hatch chile guy doesn't show up at our farmers' market soon, I'll be catching a flight to New Mexico -- hatch chile heaven. Unfortunately I've missed their annual Hatch Chile Festival, but I know that you can't walk more than a couple of blocks in New Mexico without stumbling upon a man with a roaster and 20 pound bags of roasted hatch chiles. 1. Pre-heat grill to high. Allow steak to come to room temperature. Rub it all over with olive oil, and season with salt and pepper. 2. Warm 1 teaspoon olive oil in a large skillet over medium heat. 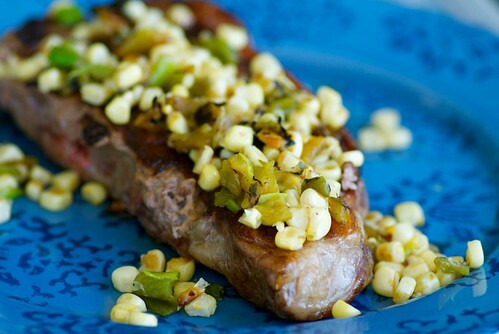 Add scallions and corn kernels and saute 2 minutes, until just browned. Add chopped chiles and warm through, about 2-3 minutes. Season with salt. Set aside. 3. Place steaks on the grill. Grill 5-6 minutes. Flip once using tongs (forks can puncture the meat, releasing tasty juices). Cook another 5-6 minutes for medium. Cook less time for rare and longer for well-done. Do the finger test for doneness: Press steak with your fingertip. Rare should feel soft and spongy; medium should feel moderately soft; well-done should feel firm. Transfer steaks to a plate. Cover with aluminum foil and let rest 5 minutes to seal in juices. Top each steak with a quarter of the relish, and dig in! Well I have never come across hatch chilies in this part of the world Susan, but I am intrigued. My brother's mother-in-law lives in New Mexico, and she's coming to Utah for a family wedding soon. I asked my sister-in-law if she would bring me a bag of chiles, but she told me it's too late in the season now, sigh. I've tried growing my own, but they just aren't the same. char-grilled peppers are so much apart of my family's cuisine. Roast them all, let them cool and place in zip-locks then the freezer. Thaw when needed, peeled charred skins and enjoy! Susan, I've never heard of hatch chilies before! Are they spicy or sweet? I'll keep my eye out for them at the farmers market. Lovely pictures btw. I want some of these, but here in Georgia I don't think it will happen. Send some my way when you find more. I am going thru the same thing. I went this weekend desperately seeking hatch chile and finding none. BI regrets that I did not pick up more the last time. Oh, no. I bought several bags that are already frozen. I am so sorry for you. I am sure you could contact the market officials and get his info to buy more. I'll be in Albuquerque over the Ballon Fiesta, would you like for me to send you some? I can taste the dish by reading the recipe. Wonderful. I've actually never had Hatch chiles and from the sound of this it sounds like I'm severely missing out! I know they had some at my local Whole Foods maybe a week ago...hopefully they still do so I can try this! And if not, I'll be headed to New Mexico with you. OR you can go to la puente to El Rey Farms where they roast hatch chilies!! I was just watching Huell Howser on PBS where he visited the farm and tried their hatch chilies. Jen-Oh, no! Say it isn't so! Thanks for the heads up and tips! val-Then you need to come South of the Border! kalyn-It's awfully early to be over. I'm so sad! peterm-I would, except you can never find them in markets here. soma- The bitter taste of regret. MKITR- How kind of you! Thank you anyway. I'll live without them until next year. Have a fun time though! joanne-You did? I'll have to check mine out too then. alanna-Buy lots of them this weekend. LOTS! I guess you need to come to New Mexico! I saw some in the store just a couple days ago, complete with a roaster out front. You not only give me a recipe for a chili I've never tried and probably won't any time soon, but you also included corn. Corn season is ending soon around here and I'm going to be so sad because I found the world's best corn at the farmer's market this season and I am really going to miss that too. Withdrawal! Withdrawal! I've had luck ordering online - shipping from NM to NY - and paying the quick TAT shipping charge. Pretty hefty but a girl's gotta do what a girl's gotta do! :) Not very locavorish, though. @ Jen Yu - love your picture, looks so much like a dog I had and loved for many years. Trader Joe's carry hatch chilis in a can - they are actually pretty good. You can also buy them in the freezer section in NM but have never seen them in Texas. I live part of the year in Taos. The chilis came and went this year in a flash. Last weekend in Santa Fe, I saw a sign for 20 lbs for $40 which is about 6 cups once they are roasted. Much too expensive for me. where'd ya get 'em? when i was a kid we would go to hatch every year at harvest and get about 200 lbs. then roast 'em on the bbq grill then freeze them. Sounds like we all need to plan a trip to the Hatch Chile Festival next year! I imagine the mixture of flavors in my mouth ... yum! sues-You're so right. I clearly didn't get my fix. kathieE-That may just have to be my solution. Thanks for letting me know it worked well for you. anonymous-TJ's? Oh, I'm there every week. Thanks for the heads up. I'll definitely check them out. anonymous-200 pounds? Whoa! That's a lot of hatch chiles! How did you transport them home? lydia-Yeah, that's it! We'll have a food blogger reunion at the hatch chile festival! feenomenale-I'm glad you find it so enticing! 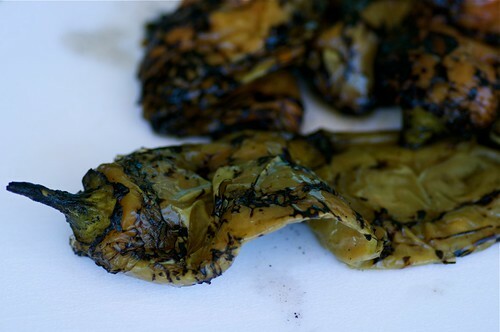 This month Gloria Chadwick will be coming out with her Hatch Chile Heaven Cookbook. I'm looking forward to its release. I love her Tastes and flavors of San Antonio.